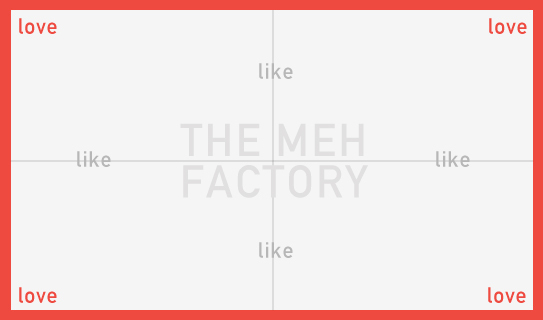 Is Your Startup Turning Into The Meh Factory? You start off with a grand vision, the big thought. You can imagine the person who will go crazy over your offering right in front of your eyes. As you find yourself diving head-first into product development, in many cases your target audience starts to automatically widen and with that you run the risk of your startup turning into a factory of…meh. A Meh Factory is pointing towards, and hitting the center of the bullseye perfectly. A good thing you’d assume, but the bullseye is smack in the middle of everything: not too this, not too that, it’s just right in the middle. A product that tries to appeal to everyone and do everything. It is not the cheapest, not the priciest, not the coolest, not the best – no, it’s just right there, sitting stagnant in the middle of it all and by hitting the target spot-on, it is missing its target audience, its initial reason for existence, entirely. Becoming a Meh Factory is an even easier trap to fall into for an existing brand that is losing its soul, a great example being Gap (You can indulge in this story, exemplifying a brand’s quest to remain relevant). As a startup you can protect yourself from falling into this gap (sorry!) early on. As you enter the development phase, remind yourself that as a new brand on the market it has to be your main goal to work towards reaching someone’s heart and not everyone’s mind. Only if you get one ‘tribe’ to not only like, but fully love your offering can you create a cult brand. And that is exactly what you should target. Shoot into any corner, just don’t point towards the center as you’d be missing your target – you know, the person you were thinking of when your idea first popped into your head. Make her love your brand, others will follow.